Bill Graffis, decorative painter and artist, is the owner of Alla Prima Studios. Bill co-owned an interior design business and showroom in Vancouver, Washington when he was first introduced to decorative painting. 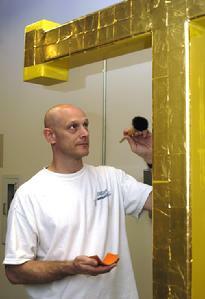 He began taking classes at decorative painting schools and gilding studios. Bill learned his craft from professionals: decorative finishes from Bob Marx, co-owner of "The Finishing School" in New York, gilding from Nancy Thorn of Portland Oregon, and faux marbling from Pierre LeFumat at Atelier Nadai. In early 1993, Bill purchased and began remodeling a 50 year old brick building. This created an opportunity for Bill to express his fascination with decorative painting and the ability to transform interior spaces. Through the remodeling process, Bill learned the importance of proper surface preparation and the variety of tools and materials available for decorative painting. "What got me totally hooked in this business was gilding," the ancient art of applying thin square sheets of metal leaf to a properly prepared surface. Bill has been invited to attend the International Decorative Painting Salon, "Salon 2000" in London, England, "Salon 2002" in San Antonio, Texas and "Salon 2007" in Aarhus Denmark. The Salon events, held in a different country each year, offer international decorative painters the opportunity to study each others' work, to watch and discuss painting techniques and materials, and to exchange new ideas. Bill currently resides in Seattle Washington with his wife and two English Pointers.